To be unveiled this Monday is a groundbreaking project based on a mobile application for the identification of lost works of art, able to identify a work of art in a matter of seconds using a smartphone or tablet. The project was developed by the Communi Hereditate Foundation with the assistance of the Ministry of Culture and National Heritage and funding from the Kronenberg Foundation of Citi Handlowy Bank. 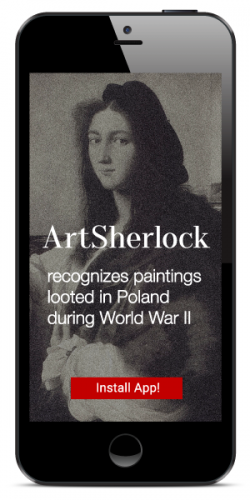 Being the first tool of its kind, the application will completely revolutionize the identification of artworks resurfacing after having been looted during wartime. The application can automatically recognize a work of art on the basis of a photograph taken with a mobile device camera. Since 1992, the Ministry of Culture and National Heritage has been compiling information on cultural property lost from within Poland as a result of World War II and taking action for its potential recovery. The Ministry runs the only Poland-wide registry of lost moveable cultural property, counting nearly 63 thousand entries and accessible online at www.dzielautracone.gov.pl. The list of lost works includes pieces by domestic and international artists such as: Raphael, Rubens, Rembrandt, Dürer, Aleksander and Maksymilian Gierymski, Jan Matejko and Stanisław Wyspiański. Recent restitution efforts have led to the return of dozens of artworks which had been lost during World War II.